The high plains reservoir in North Sterling State Park appeals to locals and tourists for water sports and relaxation during the summer months and attracts waterfowl hunters during the hunting season. The large irrigation reservoir is a joy for boaters, anglers and water skiers, with coves and fingers to explore during the spring and summer. It is closed to boating in the winter. 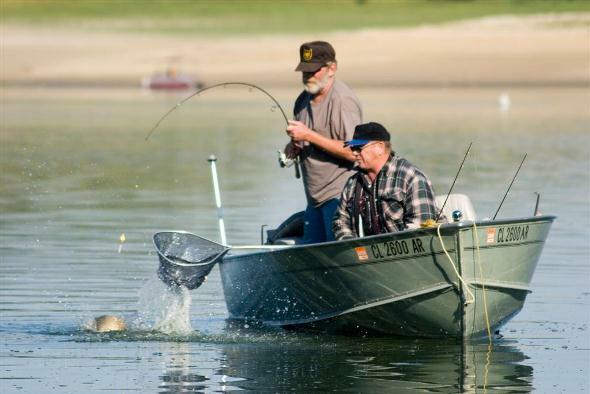 Warm-water fishing is available from the shore or by boat, with walleye, catfish and wiper bass in the reservoir, as well as rainbow trout, smallmouth and largemouth bass, and many others. Facilities are also available for hiking, biking, picnicking and swimming in the summer. Elks Campground is open all year. From May through Labor Day weekend, Inlet Grove Amphitheatre offers Saturday night campfire programs. Birders can find information about the migration of eagles and hawks to the area on the park’s website. A visitor center offers items for sale as well as educational displays. Park hours: 24 hours a day; closed to day use 10 p.m. to 6 a.m.
Office hours: Visitor Center, 8 a.m. to 4:30 p.m. as staffing allows.